On Sunday, July 28, at the DCI Southeastern Championship in Atlanta, all of the World Class corps competing in the 2013 DCI Tour will come together for the last time before the World Championships in Indianapolis. This entire competition will be webcast LIVE from the Georgia Dome on the DCI Fan Network. You'll be able to watch the complete performances of the following corps online in real-time, with the webcast beginning at approximately 1:30 p.m. ET, with the first corps stepping off at 2 p.m. 2:00 PM – Carolina Gold 2:17 PM – Atlanta CV 2:34 PM – Pioneer 2:51 PM – Mandarins 3:08 PM – Cascades 3:25 PM – Jersey Surf 3:42 PM – Oregon Crusaders 3:59 PM – The Academy 4:16 PM – Intermission 4:50 PM – Colts 5:07 PM – Troopers 5:24 PM – Crossmen 5:41 PM – Pacific Crest 5:58 PM – Boston Crusaders 6:15 PM – Blue Stars 6:32 PM – Spirit of Atlanta 6:49 PM – The Cavaliers 7:06 PM – Intermission 7:40 PM – Madison Scouts 7:57 PM – Blue Knights 8:14 PM – Bluecoats 8:31 PM – Santa Clara Vanguard 8:48 PM – Phantom Regiment 9:05 PM – Blue Devils 9:22 PM – Carolina Crown 9:39 PM – The Cadets 9:59 PM – Awards Ceremony Eastern time zone. All times approximate and subject to change. Two ways to view this webcast are available. A $24.95 pay-per-view option will give you one-time access to watch all of the performing corps at DCI Southeastern Championship. Choose the $69 Live subscription option, or Live+DVD or Live+Blu to gain complete access to all of this summer's live webcasts, on-demand replays of select DCI Tour events, discounts on downloadable media, and more! 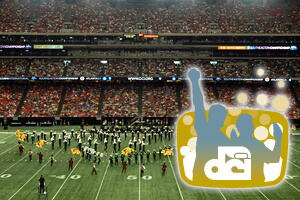 Buy tickets to the DCI Atlanta Southeastern Championship.